This plot shows the gravity wave potential energy density for the altitude range 65 - 80 km as a function of east longitude and latitude. The gravity wave potential energy (Ep) is a measure of the energy (or activity) of the waves. A high value of Ep implies many gravity waves with large amplitudes. Measurements (represented by dots) taken with the Venus Express Radio Science Experiment (VeRa) have provided evidence for the presence of numerous gravity waves in the atmosphere of Venus. These waves were evident as quasi-periodic disturbances on the atmospheric temperature profiles, often hundreds of kilometres across. The strongest activity (represented by the cluster of yellow dots at the top of the figure) was found in the high northern latitudes west of Ishtar Terra, the highest topographical feature on Venus. Gravity waves are very important since they can transport energy and momentum by propagating both vertically and horizontally through the atmosphere. They are a common feature in the upper atmospheres of terrestrial planets. 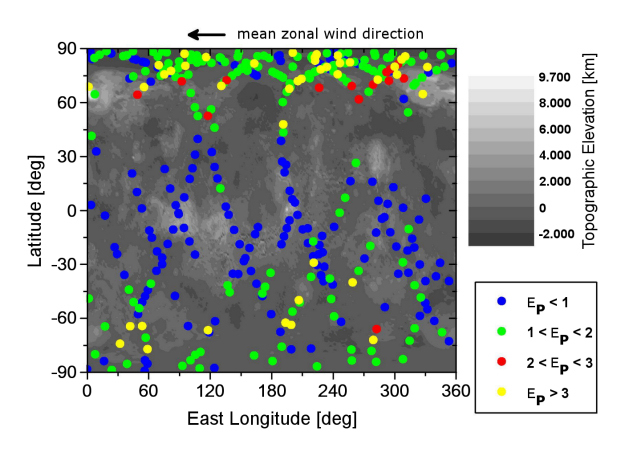 The detection of these waves and their association with a geological feature strengthens the case that topography is likely to be a significant influence on the atmospheric circulation of Venus. The topographic map in the background is derived from Magellan topography.